For other uses, see Jasenovac (disambiguation). 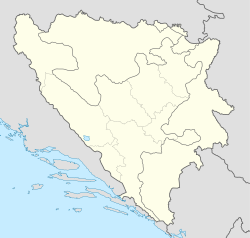 Jasenovac is a village in the municipality of Bosanski Petrovac, Bosnia and Herzegovina, located east of the town of Bosanski Petrovac, on the M5 road (part of E761) to Ključ, between the villages Bravski Vaganac and Bravsko. In 1991, the village had a total population of 430 people; 424 Serbs, 4 Yugoslavs, and 2 Others/Unknown. ^ Bylaws committee of the municipal council of Bosanski Petrovac (c. 2006). "Statut općine/opštine Bosanski Petrovac" [Statute of the municipality of Bosanski Petrovac] (in Bosnian and Serbian). Municipality of Bosanski Petrovac. Retrieved 2012-05-18. This Una-Sana Canton geography article is a stub. You can help Wikipedia by expanding it. This page was last edited on 13 November 2017, at 23:23 (UTC).